Xiaomi, which is known primarily for its smartphones business and superstar VP, Hugo Barra, positions its laptops as integrated parts of its Mi Ecosystem (which includes smartphones, an Android TV STB, tablets, power banks, headphones, a wrist band and even an air purifier). Their design resembles that of other devices from Xiaomi and uses all-metal silver and gold enclosures. Both notebooks are made by Tian Mi, a partner of Xiaomi, and will run Microsoft Windows 10 Home. 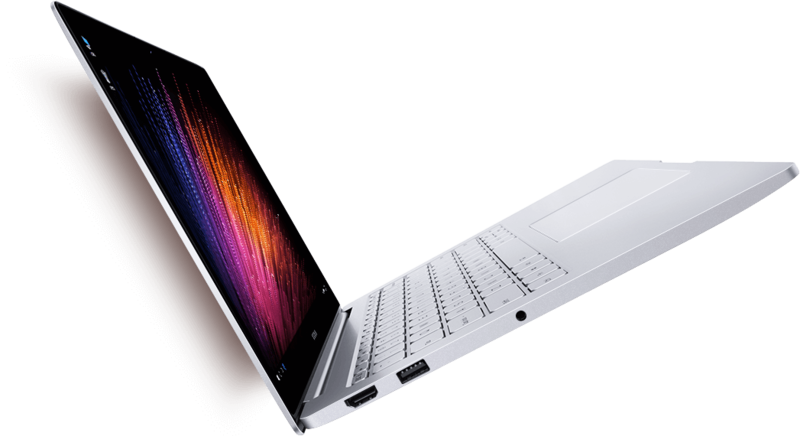 Mi Notebook Air 12.5" Mi Notebook Air 13.3"
The entry-level laptop from Xiaomi is the Mi Notebook Air 12.5”, which is powered by the dual-core Intel Core m3-6Y30, featuring the Skylake microarchitecture as well as the ninth-generation of Intel's integrated graphics (Gen 9, HD Graphics 515 with 24 EUs). The CPU is rated at a 1.1/2.2 GHz core frequency (base/turbo), 4 MB of last level cache, and a 7W thermal design power (normally this CPU is rated at 4.5W, but the 1.1 GHz in the spec sheet implies that it is running in its 7W cTDP Up mode - this isn't a surprise given the size of the device. The laptop comes with 4 GB of LPDDR3-1866 RAM, 128 GB SATA SSD, 802.11ac 2x2 Wi-Fi, Bluetooth, 1 MP webcam, two microphones, custom AKG speakers and so on. It's not stated if the design uses dual channel memory at this point, and it would be interesting to find out. The system sports one USB Type-C port for charging and display output, one USB 3.0 Type-A port as well as one HDMI connector. The Mi Notebook Air 12.5” features a display panel with 1920x1080 resolution, 170° wide viewing angle, 300 nit brightness as well as 600:1 contrast ratio. Despite the low memory, the main advantage of the Mi Notebook Air 12.5” over its bigger brother is its 11.5 hours rated battery life and low weight of 1.07 . From many points of view, the 12.5” laptop from Xiaomi attempts to combine the key advantages of Apple’s MacBook and MacBook Air (at least, from hardware perspective). It comes with Intel Core M, a common resolution screen, long battery life as well as thin-and-light form factor (like the MacBook). However, the system costs starting from 3999 yuan ($525), which means that it is more affordable than Apple’s MacBook Air. The next up is the more powerful Xiaomi Mi Notebook Air 13.3”, which is based on the dual-core Intel Core i5-6200U (2.3/2.8 GHz, 3MB LLC, 15 W TDP, Intel HD Graphics 520, etc.) and is equipped with NVIDIA’s GeForce 940 MX discrete GPU featuring a 1 GB GDDR5 memory buffer. Xiaomi says that by equipping its 13.3” laptop with a standalone graphics processor it enables higher performance in games when compared with iGPU. The notebook sports 8 GB of DDR4-2133 memory, a 256 GB NVMe SSD with PCIe 3.0 x4 interface (with up to 1500 MB/s read speed, which means that they are running the PCH in low-power mode and reduce PCIe clock-rates), dual band 802.11ac 2x2 Wi-Fi, Bluetooth, a 1 MP webcam, two microphones, custom AKG speakers and so on. The laptop uses USB-C for charging and display output, two USB-A 3.0 ports and one HDMI connector. 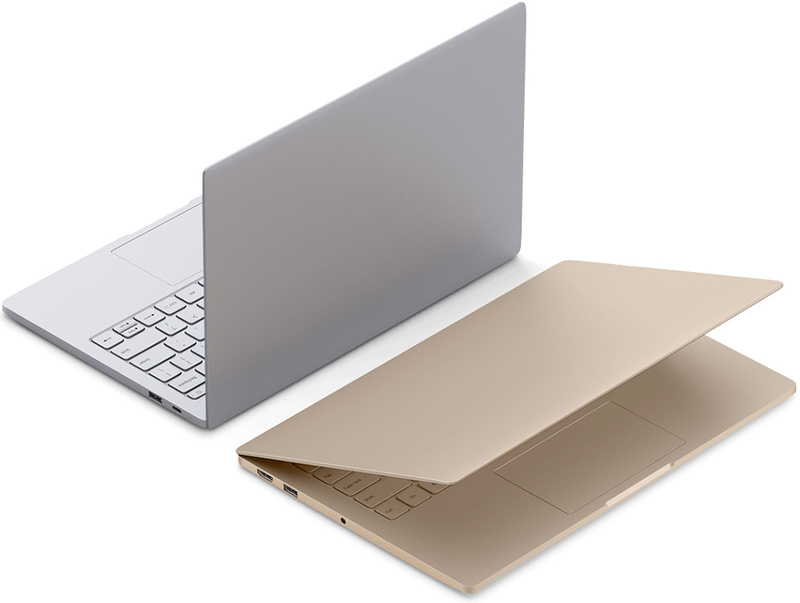 The larger laptop from Xiaomi features a better display panel than the smaller model. Despite the similar resolution, viewing angles and brightness, the 13.3” notebook has a rated 800:1 contrast ratio as well as 72% NTSC color gamut (vs 50% on the 12.5” model). However, the bigger and improved screen comes at a price: the Xiaomi Mi Notebook Air 13.3” is 14.8 mm thick and it weighs 1.28 kilograms. The laptop is equipped with a 40 Wh battery (compared to 37 Wh on the smaller model), which gives it up to 9.5 hours of rated battery life. 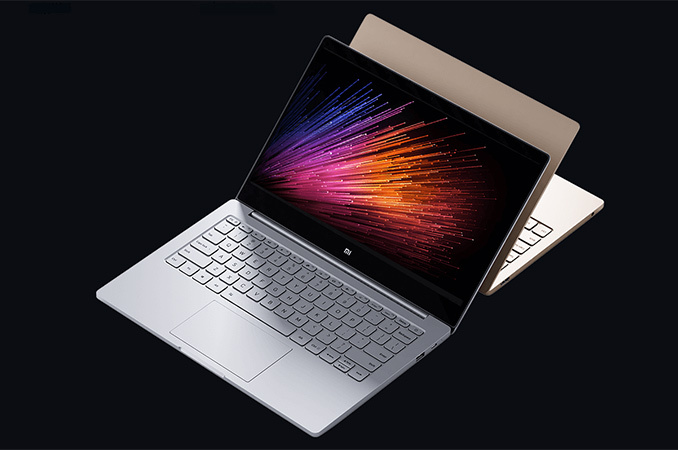 The faster CPU, discrete GPU, faster RAM, speedier SSD and better display effect the pricing of Xiaomi’s 13.3” notebook: the model costs 4999 yuan, or $750 (or $640, if that original CNY price includes China tax). Xiaomi will only sell its initial family of laptops in China at this time, similar to its smartphone strategy. Great specs, great price, it is not exactly clear how good the display is, but at least it doesn't seem to be a TN panel if that 170 degree viewing angle is true.